Yesterday we left off talking about congruency. It’s a very important topic because it’s a major disruptor of employee engagement. The story we tell ourselves – and the stories your employee are telling themselves – focus on trying to find agreement or congruency between what is said and what is done. It has a direct and monumental impact on people trying to figure out where they fit. Or how they fit. You hear me constantly say, “You’ll figure it out.” I’m here to help you do that. My work – all my work – is focused on helping business owners, CEOs and leaders figure it out. I’m not here to tell you what to do or how to do it, I’m here to help YOU figure those things out for yourself. And to help you do it more quickly so you can accelerate your learning, understanding and growth. So it goes with your employees. They’re working to figure things out, too. Mostly, they’re working to figure out how they fit, how they make a difference and some way to find positive meaning in being there. It’s congruency. In a word, congruency is all about agreement. When you say one thing and do something different, something contrary to what you say, then congruency or agreement doesn’t exist. That creates tension and turmoil. Negative chaos. People try to resolve it. They’re trying to make sense of it, to figure it out. Today let’s focus on two things: communication and action. That about covers it all, right? 😉 I mean, what else is there? It doesn’t matter if it’s written, verbal, casual, formal, private, public, body language, demeanor — it’s all communication. And it can be intentional or unintentional. It can be among the biggest burdens leaders face. It’s also why being authentic is the way to go. That doesn’t mean you simply accept that you are who you are, but it means you need to really work to on your improvement and growth to be the best YOU possible. Leaders who attempt to act will invariably slip up and show their true colors. I could preach don’t be a jerk, but your character is what it is. If it’s lacking, then you’ve got work to do to make up your mind to live differently. You’re not yet ready for leadership or any discussion about leadership. Being a genuine, authentic tyrant isn’t great leadership. This is similar to telling the truth. You don’t have to work at it. The truth is always the truth. If you’re a liar, then you must keep track of the lies. One slip and you’re done. Toward that end, you need to first be a decent (I’d argue, be a good) human being. Lean into how you roll. Don’t try to be somebody or something that’s unnatural to you. People will notice. Don’t be consumed with being perfect. You’re not. News flash: people already know that. Get over yourself. But when it comes to how you communicate, be yourself. Just put in the work to be better! Few things tire me more than leaders who want to remain as they’ve always been, but they get frustrated because their people don’t grow. Duh! You’re the leader. How about you show them the way by improving yourself? And that includes your ability to be more communicative. Be more clear. Make sure the message is accurately received and understood. That’s your job. If employees wonder what you mean, you failed. If employees hear one thing but see something different…you failed. When things don’t make sense to the employees, you failed. That’s congruency or agreement. Your job is to manage that for the benefit and welfare of every individual employee, and for the collective organization. It’s how vision and mission are accomplished. And it may be the single biggest challenge you’ve shared with me in the last week or so. Let’s dive into it by starting with the words we use. I’m a bit fanatical about word usage. I looked back at the emails I got and almost all of them contained the phrase some semblance of “how can I get employees to” fill-in-the-blank. The word GET jumps out at me. It smacks of control and coercion. That’s not leadership. That’s what I call tyranny. But I’m empathetic that leaders don’t always mean what they say and that’s a problem, too. Congruency and agreement. See what I mean? Let’s reframe the questions. 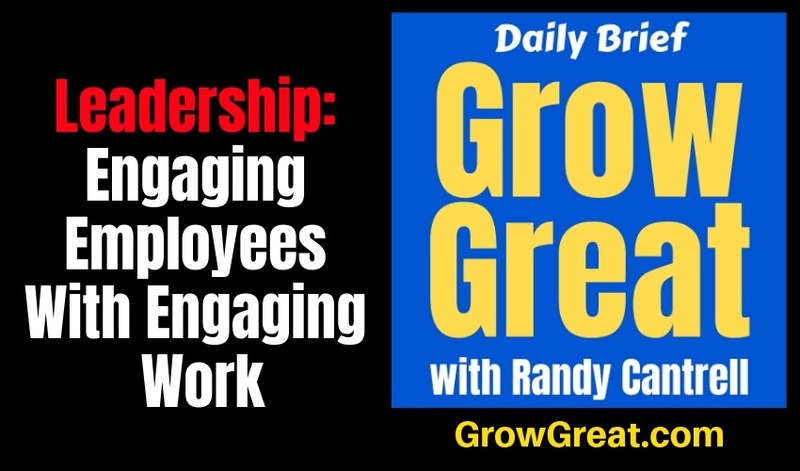 How can we serve our employees to be more engaged with what our organization most needs to accomplish? How can we serve employees to share the priority of leadership? How can we serve employees to take ownership of their work? Argue that it’s subtle change and I’ll argue it’s a monumental difference. It’s the difference in a CEO who addresses the troops and constantly uses the pronoun “my.” Versus the CEO who uses the pronoun “our.” One 2-letter word versus one 3-letter word. BIG difference! Give people a story that serves them and the organization. Communication and actions have to match. Otherwise, the story breaks down. And by the story, you realize I don’t mean fiction. I simply mean what we all do to make sense of the world and our place in it. In this context, it’s the world of your organization and every person’s role in it. Notice the order of importance. The story must first serve THEM, then the organization. Don’t reverse it because it won’t work. Whenever I see big leadership challenges, that’s often the reason. Leaders are trying to force what serves the person into the context of the organization instead of working to serve the person’s ambitions by finding the best opportunity within the organization. You’re failing when you’re putting the emphasis first on the company, or the organization. The people are the organization! Here’s what that means at the practical level. Foster growth and improvement. That means the job or role being done by an employee today may or may not be the ideal spot for them in the future. And it may also mean some people will outgrow your organization entirely. Some will need to leave the nest of your organization so they can fly higher. Help them do that. Consider the downside of NOT doing that. You’re stuck with people who hate where they are. People who are doing work they’d rather not be doing, but for some reason, they won’t decide on their own to do what’s best for them. Fear and other things stop them, just like they stop you from growing. That’s why top-level leaders need (and should crave) being positively challenged. You can focus on getting the people in the right seats on the bus, but I hate that picture. A better picture is to make sure the people in the seats on the bus are ideally suited for that seat, on that bus. One emphasizes the roles needed by the company. The other puts the focus on the needs of the people in context with how they can ideally serve the company. And THAT provides the congruency people must have to be engaged. Communicate what you’re doing and what you plan to do. Then do or be doing what you say. It’s very complicated. 😉 Just do what you say. Say what you’ll do. That’s the best communication and action advice I’ve got. That’s being congruent. Then provide congruency or agreement for individual employees by helping them see where they fit in that plan. That’s the key thing many leaders miss. If they get the communication and action congruency part right, then they miss getting the people congruency part correct. Your leadership mandate is to help every individual employee see where and how they fit. And that has to be in agreement with what they most desire. Which is why you must know your individual employees and better understand the context of their life. Look at your own life. Do you want something different today than you did five years ago? Has your life changed at all in the last 5 years? Then stop looking at your employees the same way today as you did last year, or 5 years ago. They’ve changed. Hopefully, they’ve grown and improved. You have to provide the right environment to reward that and foster future growth and improvement. Let me end with some specificity. I got a few emails where top leaders lamenting that their direct reports weren’t always putting the emphasis on things they most wanted. Keep in mind I don’t always have the context necessary to know exactly what’s going on, but I do have some ideas that I hope will help. Look at the congruency of your communication and your action. If your direct reports aren’t focused as intently on doing what you most want to be done, then there’s a disconnect. Or they’re simply rebelling. I’m going with the former, not the latter. I don’t believe most people are rebellious. I think most people want to do good work. I have questions if this applies to you. Are you sure your direct reports know and understand what’s important to you? Do they understand how important it is to you? Do they agree with you? Don’t dismiss that last question. Find out. You’re going to have to provide safety in order to find out. If you can’t find out, then we’ve unearthed another big leadership challenge – providing a safe environment where people are free to express themselves. Remember that hierarchy of needs? Safety is high on the list. It’s a foundational fixture we each crave and need. You’re the leader. It’s your job to provide safety. It’s not the burden of the employees to feel safe. You bear the burden to help them feel safe. Safe enough to disagree with you. Safe enough to tell you why they’re not following through on the things that matter to you. Here’s what you’re likely going to discover. They haven’t seen the congruency in your communication and actions. They hear you say it’s important, but they don’t see it. They see something else matters more. So they minimize what you say and focus on where they see you act. And you’re frustrated. But so are they. Remember, they’re trying to figure this out and make sense of it. Particularly, they’re trying to figure out where they and their work fit. It’s a daily struggle for them if you’re not making it clear and easily understood. It’s beyond a struggle if you’re doing that and displaying how little you care about them individually. You want them to do what you’re unwilling to do – care more! More often than not I’ve seen employees who would happily do what leadership wants, but they’re just not sure what that is. We shoot ourselves in the foot with our rewards, with our words, with our actions and all the areas where we just don’t commit ourselves to congruency. The result? Chaos. And the worst kind. Confusion. Anxiety. Panic. Apprehension. Hesitation. Lack of confidence. And now maybe you’re thinking you may know why your organizational performance isn’t higher. Those are not attributes of high performing individuals or teams.